Unit in good condition features 2 bedrooms, 2 bathrooms, and 1 car garage. The kitchen has all appliances including garbage disposal and washer and dryer. The community offers a Media-Center and 24/7 fitness center. Pool, jacuzzi, tennis courts, play ground for your kids; also car wash area, and valet trash pick up. 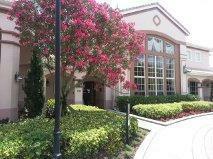 Close to I-95 and all commercial area of St Lucie West. Move-in Requirements: First, Last And Deposit.